I’ve played about briefly with AX.25 in the past when tinkering with APRS, but never really had much success with it and with TNCs being both hard to come by and damn expensive for what they are, it has always been out of my reach. Recently I acquired a couple of second hand TNCs and have spent the weekend setting up and connecting. 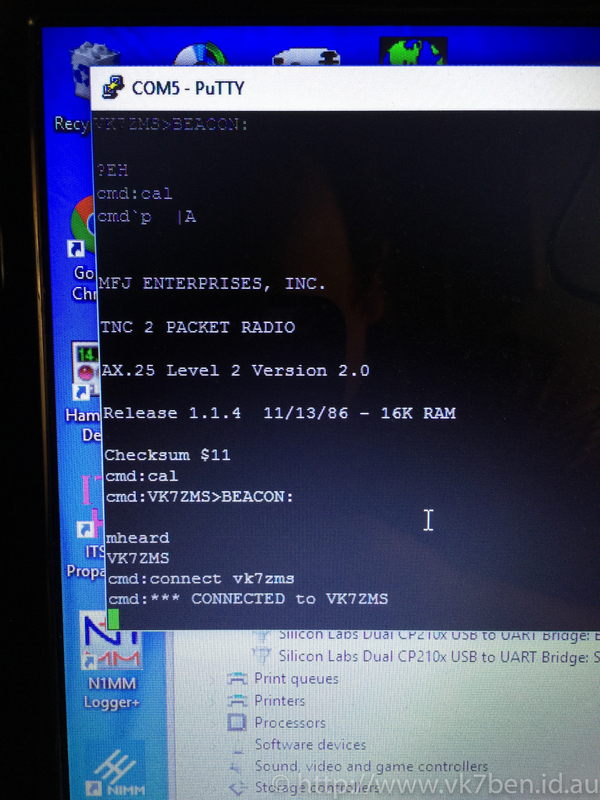 The first TNC I attempted working on was a Paccom TNC 320. This meant creating a cable to go from the 5 pin DIN connection on the back of the TNC to the 6 pin mini-DIN connection in the back of my ICOM radio. The first attempts at this involved using the mini-DIN tails from old PS/2 Mice or keyboards, testing to see if their wired up pins were going to be any good for the TNC and then just soldering the 5 pin DIN on the other end. I spent an evening with VK7ZMS doing this and after much testing, we got to the point where we had PTT and 1200 baud AF working, but no RX. Even then. the AF out tones were low. Over the weekend I bit the bullet and visited Jaycar and bought some more mini-DIN, 5 ping DIN and multi-core wire and created my own cabling. This time I was also armed with an MFJ-1270B TNC which was my fallback option if I had no luck with the Paccom. Plugged everything in, fired up a Putty serial connection, got presented with garbage. Changed the terminal baud settings, still got presented with garbage. Thought at this point it’s probably a good time to read the manual. Interesting thing about the MFJ TNCs is that they use 7 bit words, not 8 bit like many other devices. Updated my settings and bingo, was presented with text that looked like a TNC. Ran the calibration tests, PTT worked, I could hear tones being sent loud and clear, and most importantly I was receiving packets as well. I was in business. Finished assembling the cable, plugged everything back in and found I had Rx, PTT but no tones out. Back to workshop again and found in the final assembly I had caused a small short across some of the pins. I fixed the issue, liberally applied hot glue to hold it all in place and provide isolation and put it all back together again, and now it works! As you can see above, I have managed to successfully connect to VK7ZMS. I have also connected to VK7HDM-9 using VK7ZMS as a via. I already know of a few other amateurs getting interested in packet again, so who knows, we might see a bit of a packet radio revival in southern VK7!